There are many people among us who are not as physically able as we are. They may have a range of physical issues with them, some of which are, unfortunately, incurable. But that does not mean that they should be isolated as the ‘other’? They need our help and it is only through our joint efforts that we can assist them. A team at Farmington High School has shown the world how we can take a small step to bring about a massive change in the life of another person. Born with a genetic defect, Cillian Jackson was not able to perform proper motor functions. The only movement that this 2-year-old could do was with a stroller or move around in his parent’s arms. For a 2-year-old, this lack of freedom must have been difficult. Though Cillian may not express it, his parents knew that they had to do something about it. They wanted to buy a wheelchair for their child and give him the freedom to move around on his own and gain better independent mobility. Unfortunately, Cillian was too small to get any insurance and a proper wheelchair would have costed about $20,000 or more. Tyler Jackson, Cillian’s father, had almost lost all hope. But he tried to contact his former school for help. The Farmington High School had a robotics team called Rogue Robotics who had won a lot of awards for their wonderful inventions. When they heard about the 2-year-old, they knew that they could bring about a positive change in the child’s life. There was no hesitation – they started immediately. Cillian’s parents provided them with a Power Wheels riding toy, This was the base on which they worked. They changed and modified all the electronics present in the chair and also added an accessible customized joystick for Cillian to control the wheelchair. They found a child-sized bicycle seat from Amazon and bought it. It fit right in. They used pool noodles for the edge of the toy so that it could act as safety bumpers and they also put in a 5-point harness so as to keep Cillian in the chair, safe and secure. All along, they got help from “GOBABYGO!” – a program at the University of Delaware which is involved with helping children who have disabilities. The team made it a point to keep the components cheap and affordable. It was a challenge for them. And they succeeded in making it. 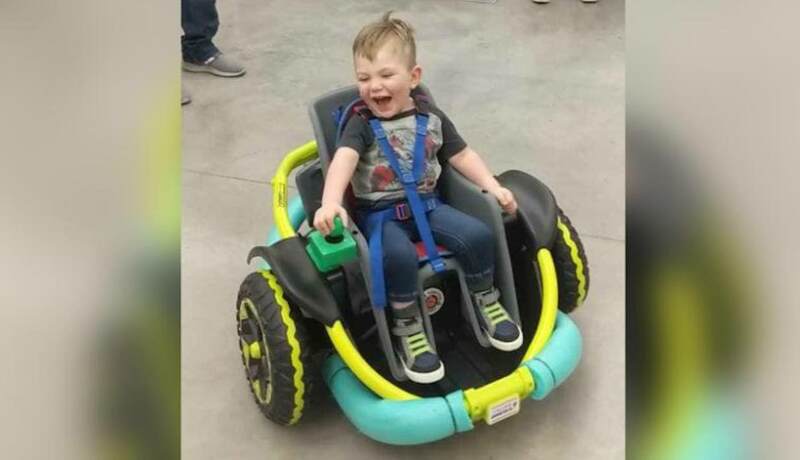 The 2-year-old was gifted a new set of wheels and now, he was really excited to explore the world on his own. He even gave the school students a visit in his new car. When the high school students saw Cillian going around the room, they were really content. His cries of joy touched their hearts. The Rogue Robotics may have won many awards, but this simple act of kindness steals the day. A team member mentioned to KARE11 that they have won something here that they don’t win in competitions. They had helped change someone’s life. The Rogue Robotics team demonstrated that if you have good intention, you will always find people who will help you progress. They also showed that people with disabilities need not face any issues in their lives – they just need our joint efforts to encourage them to be out there.
? Artist Illustrates His Struggle With Depression In An Extraordinary World Of Spirit Animals Vietnamese Company Makes Straws Out Of Grass Instead Of Plastic ?